Even flying geese need a little direction now and then! The design of this quilt is based on the central motif of flying geese, but additional elements give it a hint of native charm to arrive at a modern medallion destination. One single block design used in several color-clever ways gives the patchwork an overall complexity that is more simple to assemble than it appears. 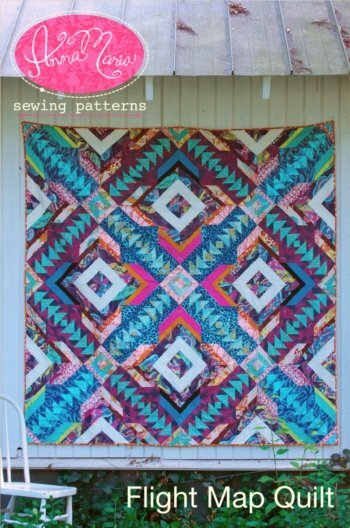 The cover quilt has been designed in a medallion style and uses 20 fabrics (7 solids and 13 prints). The following yardage requirements lists each of the 20 fabrics by depth of color (how light or dark the color is). There is further description of each of the colors used in the feature quilt in parenthesis below.